Sifting through nearly 3,000 pictures of the Italy trip is proving to be a fun albeit time-consuming task. I’m creating an album exclusively of items eaten at each meal, but it’s not quite finished yet despite being back in the States for a little over a week now. It’s been an interesting transition to return to a land with an array of ethnic flair. I’ve had a hankering for sushi, Mexican, Chinese, and traditional, simple American foods. I never thought I would long for cold milk or eggs. The absence of all aforementioned edibles in Northern Italy wasn’t something I ever expected to miss, but apparently these things have grown to be an important component of my healthier, mostly vegetarian eating. Back home in New York, I’ve been able to fulfill all these cravings. Not until today’s lazy Sunday morning did I come to my first impasse. After a late night out sipping cocktails along the Hudson River, I thought a greasy egg sandwich and coffee might be the best route to fill my rumbling early morning belly, but I was also eager to have a fresh, nutritious brunch. Since the raw-vegan challenge, I’ve tried to keep my eating healthful and mindful, bulking up on the good and skimming off the bad. Could I mingle the known New York hangover cure with something wholesome? In my hazy state, I couldn’t decide what to do. 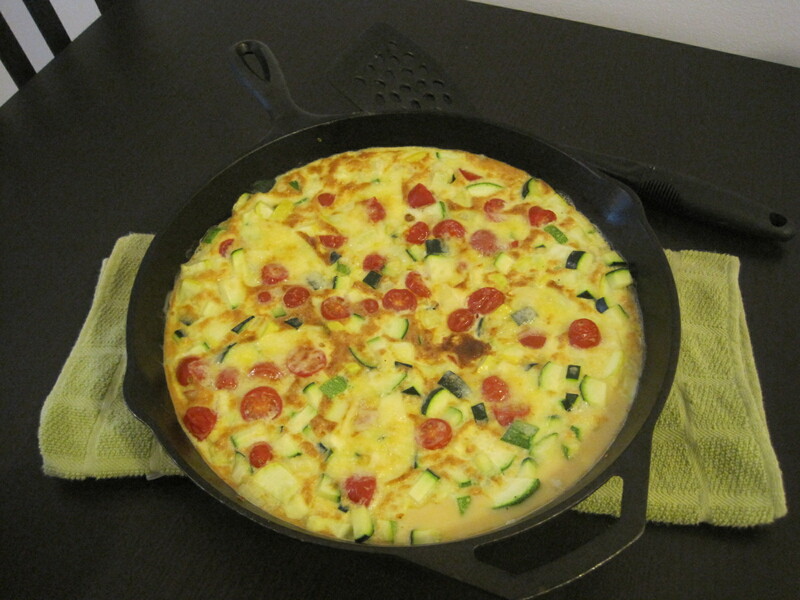 But then it came to me… Ah, yes… a frittata. I’ve never made one before nor have I ever been inclined to, but this seemed like the perfect opportunity to change that. A bit of research mixed in with a can-do attitude helped me bring together elements from the Tompkins Square Park farmer’s market to create a blissful brunch. I picked up three kinds of local summer squash to squeeze out the last bits of the warm season along with a small onion and a carton of fresh grape tomatoes from the Greenmarket. 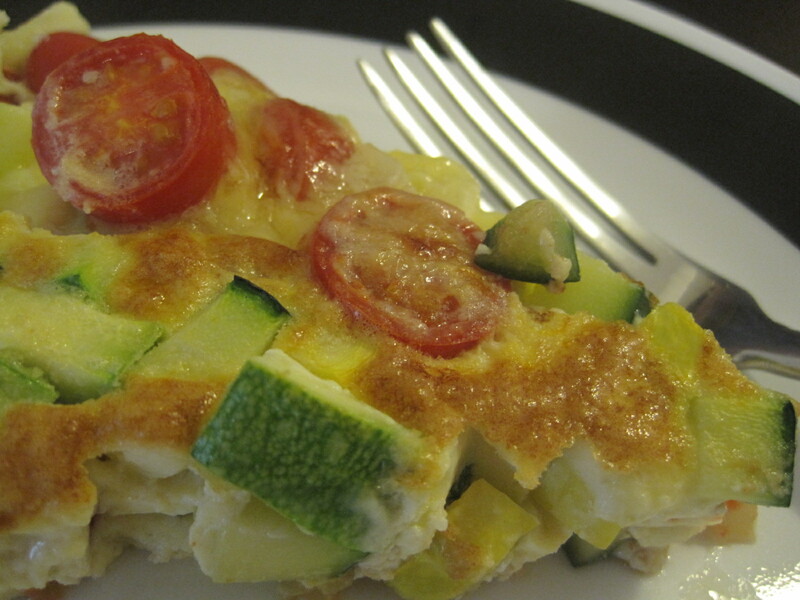 Walking along the park to the Consider Bardwell Farm artisan cheese stand, I picked up a nice piece of Pawlett cheese to blend into the egg base and place on top of the eggy-veggie mixture. Paired with some fresh California berries– since the New York season is long past over– plus a yummy balsamic reduction, I entered a produce-fulled heaven. I’m happy with my creation… It served its purpose to settle my stomach and fill me up with nutritious goodness. I may miss the Italian culinary adventure, but there’s some pretty darned good opportunities right here in New York. Next post: Oops. An energetic malfunction. 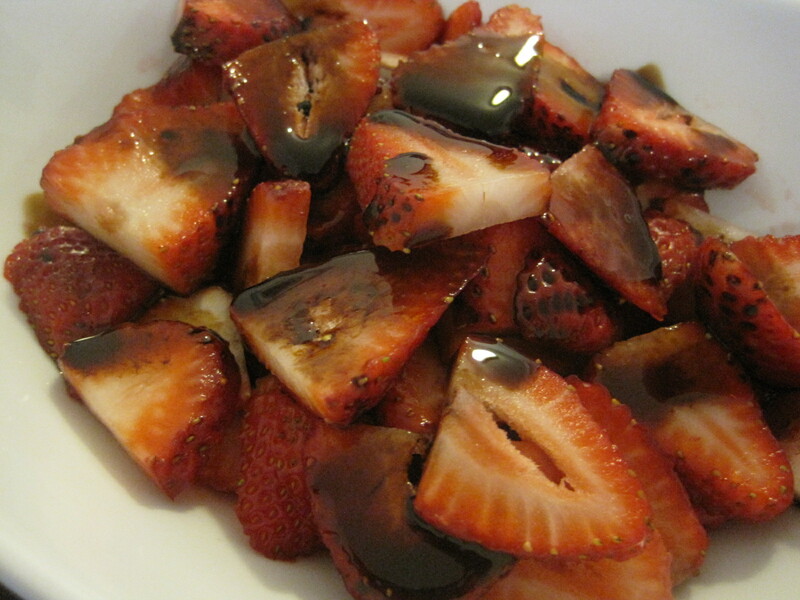 Wow, how did you think of making a frittata AND balsamic reduction with the strawberries? Stroke of genius! very nice- I’m inspired to make this combo!